In 1880, about 104,000 people lived in Providence. Thirty years later, the city’s population had more than doubled, reaching over 223,000 people. Most of this population increase was due to immigration; among those attracted to the city’s numerous manufacturing and industrial jobs were Irish, Italians, French Canadians, and Germans. This rapid population growth fueled the dramatic expansion of new residential areas at the city’s edges – areas like the Reservoir Triangle neighborhood of Mashapaug Pond. Today, although the people who call the neighborhood home have changed over time, Reservoir Triangle remains one of the most ethnically diverse spaces in the city. In recent years, immigrants have come from such places as Cambodia, Ghana, and Vietnam. Since the 1950s, a large number of Latino immigrants also have made Providence their home. 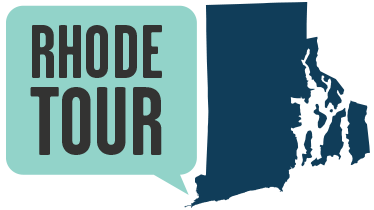 Today, Latinos make up close to forty percent of the city’s population and tiny Rhode Island is the twelfth most Hispanic state in the country. Asian Americans are also well represented within Providence, consisting of seven percent of the city’s population. These groups – like the immigrants to the region in the early twentieth century – are united in their common interest to create new lives for themselves, using both what they find here in their new country as well as skills, traditions, and practices brought from their homelands. Immigrant groups and refugees in the United States face many challenges, but there is much to learn from neighborhoods where diverse groups work together to create positive change. In the Reservoir Triangle neighborhood, Mashapaug Pond can be the catalyst that unites these groups. Mashapaug Pond, with its contaminated water and restricted access, can be an imposing site to newcomers in the neighborhood. Sokeo Ros, who moved to the Reservoir Triangle neighborhood from Cambodia, says that many of his neighbors avoid the pond: “It’s a beautiful neighborhood. It’s quiet, it’s not loud, it’s nice. There’s a lot of trees, which I like. I love trees. And then there’s this pond. That nobody goes near.” The big fences that surround the contaminated land of the former Gorham plant intimidate residents, block their view of the pond and create a culture of fear. For some residents, the pond beckons with the opportunity to fish and enjoy nature in the city. Samnang Yong, another Cambodian resident who grew up in the neighborhood in the 1980’s, remembers shopping at local Asian markets and fishing in the pond: “Coming from a country where we were just always fishing in our backyard. We don't expect anything, we just go and fish for food.” Now years of pollution have made the fish unsafe to eat. Discouraging this practice and educating people about the pond is an ongoing struggle. Some area residents try to teach their neighbors about the pond. Ana Quezada, originally from the Dominican Republic, works with the Environmental Justice League on outreach and education. She compares the neighborhood – and especially the presence of the pond and its plant and animal life – to her experiences growing up in the Dominican Republic. “Well for me being near the pond is normal because I come from the Dominican Republic. There it is hot all the time. We had a lot of mosquitos and we used to see all kinds of wild things.” Ana Quezada notes that her husband enjoys sitting out by the pond and that she has community events at her house. She hopes that in the future the cleaned up pond will be a more vibrant and lively space for all members of this diverse community. Besides the United States, what other countries do you have ties to? Do you smell any food being cooked in your neighborhood? What types of food does your family make at home? What can the immigrant history of this area teach us about Providence and the United States? 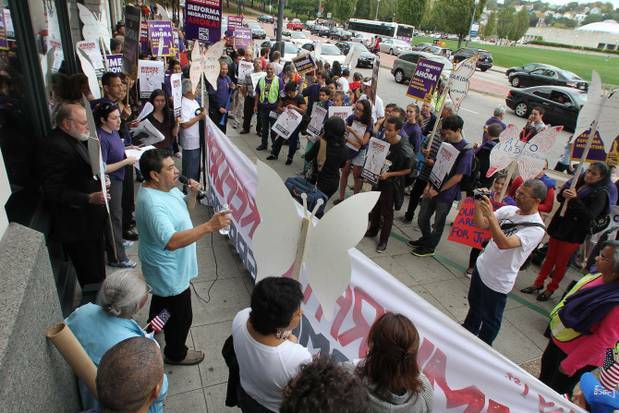 Immigration Protests: Immigrants in Providence, Rhode Island, and across the United States have won many political and legal battles over the years. Most recently, activists, labor unions and community organizations have been working to get comprehensive immigration reform passed. 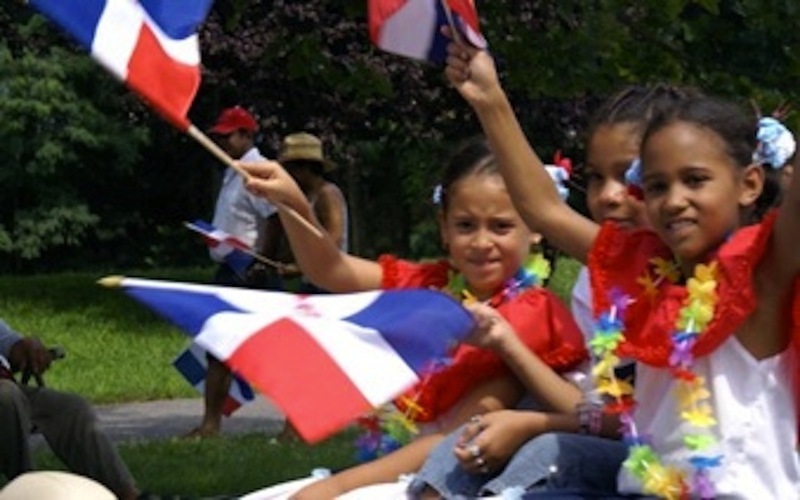 Dominican Festival: This photo is of a group of youth at the Providence Dominican Festival, an event celebrated in the city each summer. 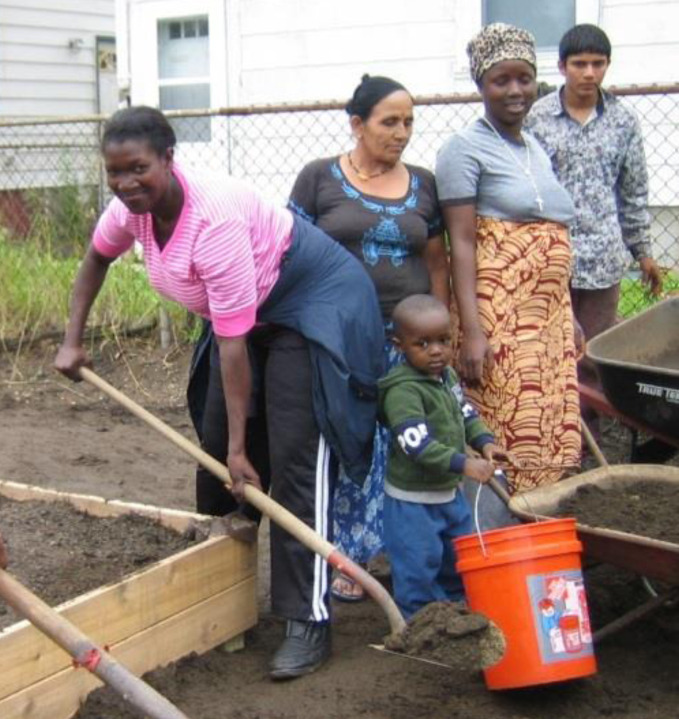 Community Garden: Maria, a refugee from the Congo, has been coordinating a Community Garden for the Southside Community Land Trust and working with refugee families from all over the globe to cultivate and share the produce from the garden. Kate Diedrick, “Old Traditions in a New Home: Immigration in Reservoir Triangle,” Rhode Tour, accessed April 21, 2019, http://rhodetour.org/items/show/21. Cronon, William. Changes in the Land. New York: Hill and Wang, 1983. Nuestras Raices. “Latinos in Rhode Island.” http://www.nuestrasraicesri.org/LatinosinRI.html. Parker, Paul Edward. “Report Ranks R.I. The 12thMost Hispanic State.” Providence Journal. August, 31, 2013. Providence Department of Planning and Development. “Providence Tomorrow: West End, Federal Hill and Reservoir Neighborhood Plan.” http://www.providenceri.gov/efile/1931.pdf.